Everyone has been wondering what Nissan is hiding under that red sheet. Is it a Gran Turismo Vision Concept? Is it the next GT-R? From what we hear, it might be both. 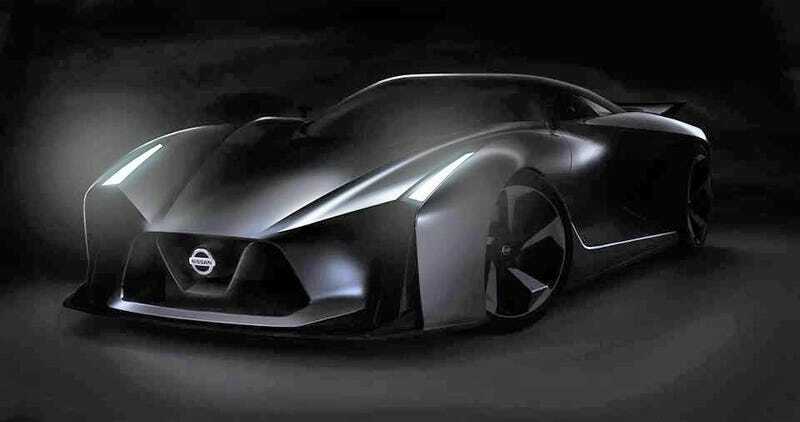 Is The Next Nissan GT-R Going To Debut In Gran Turismo? On Twitter today, Nissan released the first teaser image of the mystery car they're set to unveil on Monday. It's very dark, but through the magic of Photoshop we were able to shed some light on it. It looks like what happens when a GT-R hooks up with a Ferrari Enzo, and I'm fine with that. The big will be what it is, exactly. While we're pretty certain it will be a digital car for Gran Turismo 6 like Volkswagen's recently-unveiled GTI Roadster, we also hear it heavily previews the looks of the next GT-R.
Next Monday should be very interesting indeed. Who's down with this design for the next generation of Godzilla?